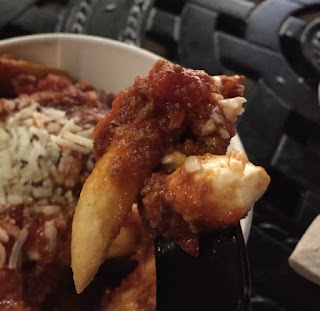 When we went to Disney World back in May, 2017, we tried Italian Poutine at The Daily Poutine. The ingredients are french fries, mozzarella and bolognese sauce, and as it's Italian, we thought the bolognese is pork but luckily they use turkey. --- My husband doesn't eat pork so that it's perfect for us. There're mini mozzarella balls and they kept the shape under the hot bolognese sauce without melting. 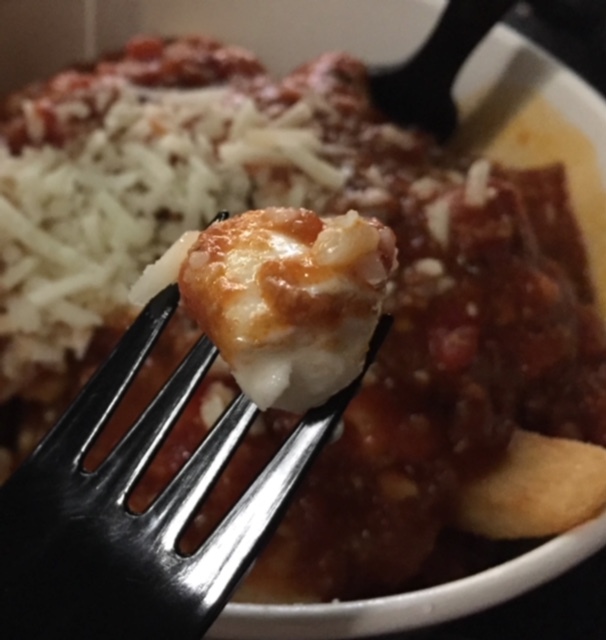 Over the same, there're some shredded cheese and it tasted like parmesan cheese. Bolognese sauce was a bit salty but had dense tomato flavor with a hint of sourness. Ground turkey was plain and didn't have meaty odor. As always, the thick cut potatoes were fried to crisp.